unprecedented value and a proven track record of unmatched strength. 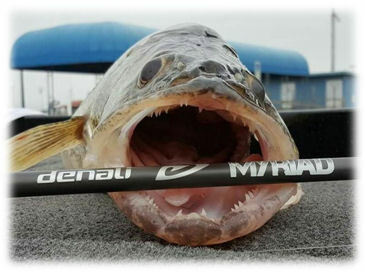 This top flight reputation now enters the Walleye market with the launch of the Myriad Series. These rods were designed with input from six top national and regional walleye anglers. catching walleyes from lakes, rivers and reservoirs. of rods to catch walleyes or saugers anywhere. This is a Walleye 101 Members Only pre-release & sale. Please do not share this with any Non-Members. All Denali Rods sold before 06/01/2016 memberships will be verified and any non-members trying to purchase rods before then will be charged an additional $50.00 to pay for their Membership.